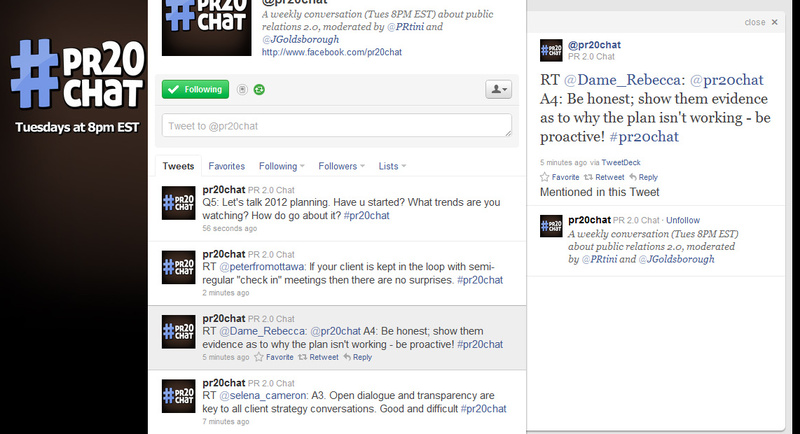 So what exactly is a Twitter chat, you ask? Well, they are events that allow Twitter users to talk to each other about a specific topic by using hashtags to easily organize questions and answers! They sound more complicated then they actually are and they are a great networking tool! Think about it – you can network in your Snuggie if you wanted to! I’ve observed quite a few twitter chats but have actively participated in two. 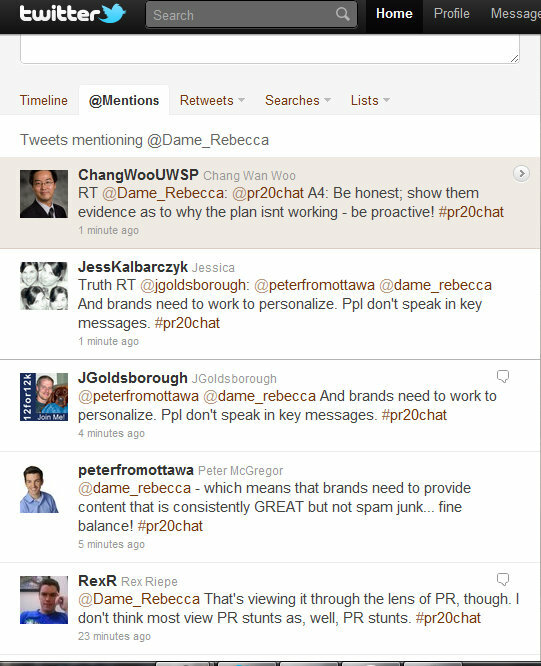 My very first Twitter chat was back on September 27 and it was through PR 2.0 Chat. At first I was a bit intimidated because most of the chatters appeared to be professionals in the field. I felt like I wouldn’t have much to contribute since I’m still an undergrad, but I thought I’d give it a whirl anyway. 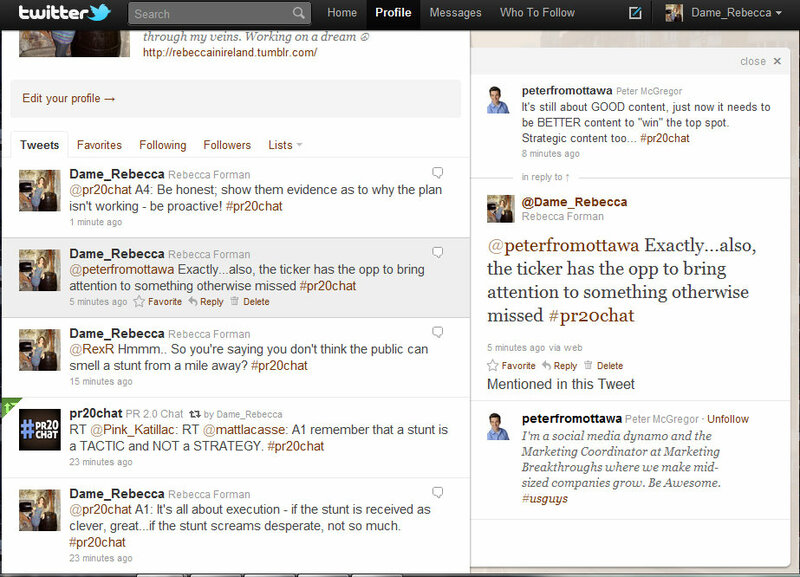 I was quite surprised when people actually started replying and re-tweeting what I had to say! The account asks questions and you can reply to anyone you want! The first few questions were about stunts and content. The first few questions involved publicity stunts and questioned whether or not they work and if they should be considered tactics or strategy. I replied that they only work if they are clever and if the public does not feel like the stunt is desperate. I received a tweet questioning my response, to which I replied but received no tweet back. However, I did manage to have quite the Twitter feed going when one of the questions asked what to do when a client’s goals aren’t being realized. I applied things I’ve learned in class to common sense and I found the dialogue fascinating. The hosts even re-tweeted me on their page! Not bad for my first try, eh? 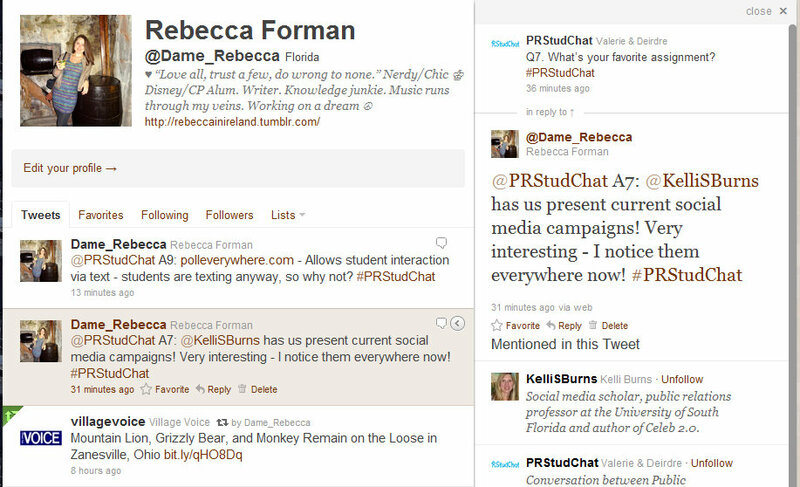 The second Twitter chat was on October 19 and was through the handle PRStudChat. 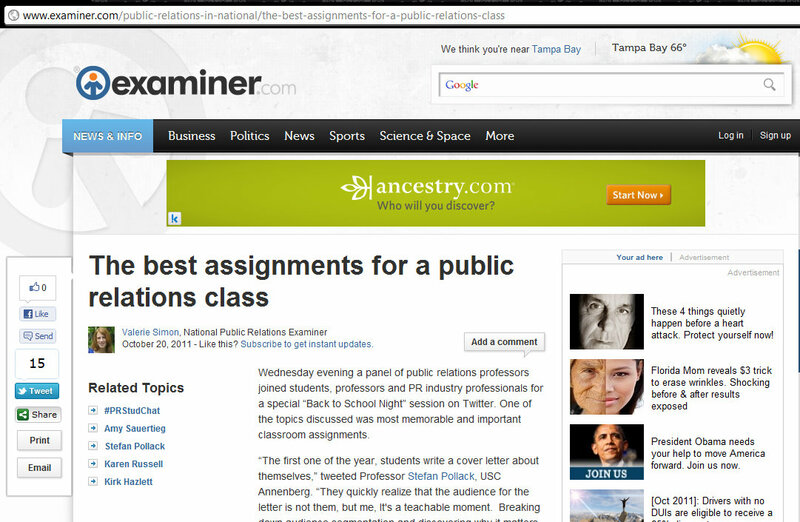 Two moderators facilitate the chat and stimulate a conversation between students, educators and professionals. I really enjoyed this one because it asked questions like: what is your favorite assignment? This was an easy one for me because my favorite assignment was a social media campaign (see my portfolio) that I worked on just recently. And GUESS WHAT?! 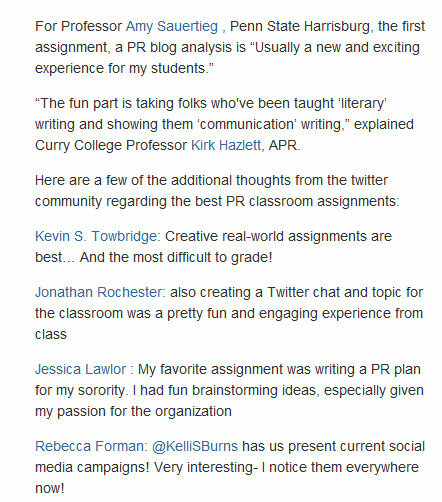 My tweet was published in an article the following day! The Buccaneers is on a rampage! Firing the mascot over silly string is SILLY!